NOW! FRC Logo Gear Available! Show your support with FRC attire, coffee cups, and more! Working with our friends at Zazzle.com, we are happy to announce that you can now get several distinctive items with our FRC logo. These good-looking items are an inexpensive way to show your support for conservative principles in Fluvanna County. Available items include caps (in two different colors), coffee cups, and FRC badges, as well as t-shirts with the Republican Creed. 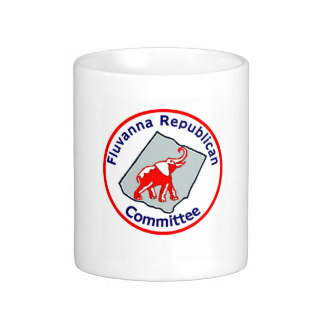 Best of all, your Fluvanna Republican Committee will receive a commission for each item you purchase. These funds will go directly into supporting FRC candidates, activities, and events. Get your FRC-logo gear now! Click here or click the permanent link on the left sidebar of this website.